Square? Not knowing exactly what that meant, I thought I’d be better off buying a 1964-65 Falcon wagon with their “more square” body lines. 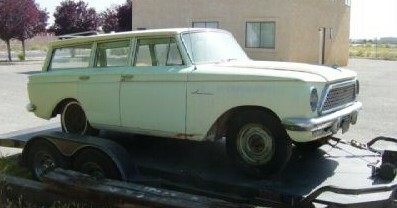 Looking for a 64-65 then, I found this 1961 Rambler American wagon for sale on Ebay. I think there’s a slight resemblance to the square bodied Falcons, but this Rambler’s got a style all to it’s own. Plus, I liked the fact that you’d rarely see another one. I bought it for $400 as you see it above and towed it home. Naturally, the ideas started flowing. How would I build this thing? 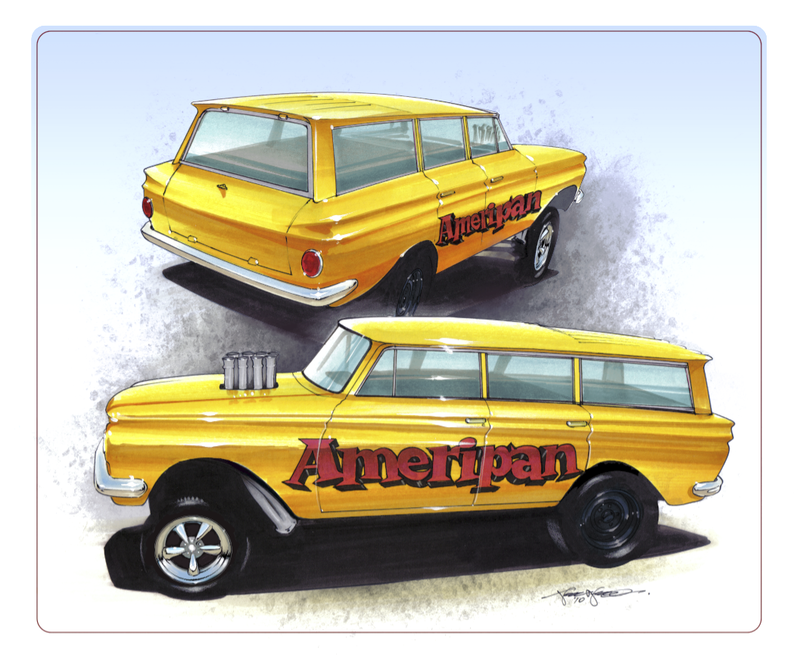 I hit the net trying to find other Rambler wagons and found this 62 Rambler American built by Stoked Out Specialties. (their website’s down). I’d guess most people will compare this slammed and billet-wheel’d beauty to the funky, nose in the air gasser I’m showing above and be quite certain I’ve lost my mind. Maybe so, but that’s what My Ride is Me means, right? It’s me. It’s mine! My next idea’s the one that won’t make sense to most people. Gasser! I want an A/FX styled, 60’s factory race car inspired, low buck noise maker! That’s what I’m going with. Look closely. Can you see what’s changed from the first drawing? Obviously, we decided against the red windows. While on paper, they really make a statement, in reality, I couldn’t build it that way. Plus, driving it would probably drive me (more?) nuts! After that, I asked Joel to throw on some old-style, chrome 5 spokes up front and to make sure the cheater slicks out back were on black-er steel wheels. The rears also needed to be poking out of the radiuse’d rear wheel well. For practical reasons, I’m not altering the wheelbase by moving the back wheels forward. The wheelbase is only 100″ to start and as you can see, the rear wheel well is already butted up against the back door. Yea, it’s a 4 door! I checked, 4 door drag race wagons were a real thing in the 60’s. As it is now, doesn’t it hit the low-buck, 60’s inspired gasser look? I love it! Finally, the name. “Ameripan”. 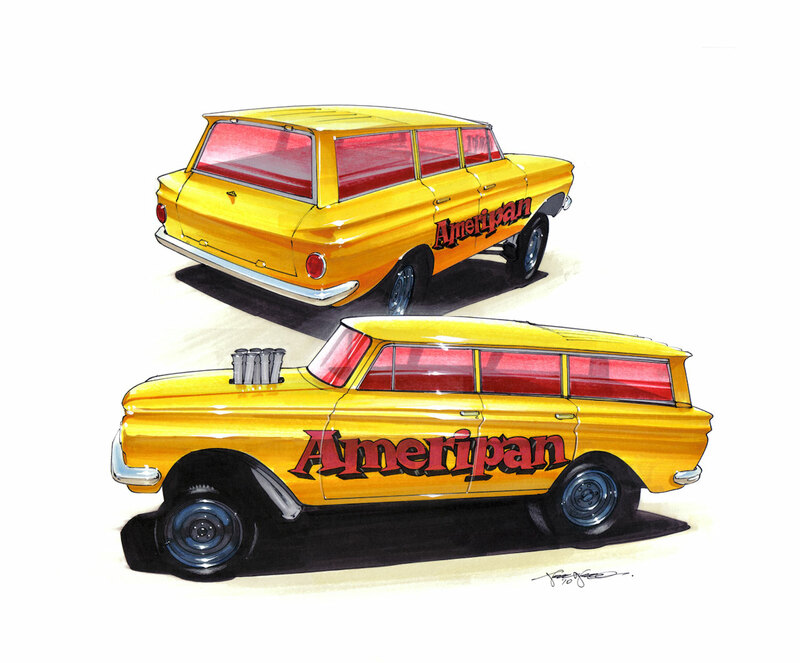 That’s a combination of Rambler, “American” and “Japan” to make Ameripan. I didn’t come up with the name, my kids went to a Japanese school for American kids with that name. Why am I using it? I’m an engineer for Nissan so I want to put a 5.6L Titan V8 in my Rambler. THAT will finish-off baffling anyone who wasn’t already confused with my choice of rides. Perfect. Next step? Get a straight front axle kit from Speedway Motors and get busy! I’d love to hear your reaction. If you’re also a Rambler or wagon fan, let us know and please sign-up here. MyRideisMe.com’s community… Become a part of it! 2013 Muscle Car and Corvette Nationals – Barn Finds That Will Make You Breath Hard! It has the perfect lines for a Gasser wagon!!! Two thumbs up. What a great ride it will be! Are you sure the red windows are expensive? I saw a very late model car today with windows that were that exact red and it was a very plain type car…maybe it was tint but the color was exactly like your rendering! I have a 59 Rambler Wagon all ready to do this..no title alas. There’s a few minor issues..for one, they are partial unibodies. No real frame to speak of. The engine bay is quite narrow too, but if you cut out the shock towers, sure, a big block could be squeezed in there. I love the lines of the car and had hoped to make a street rod out of it, but moved onto other projects. The unibody issue isn’t a killer..Falcons are unibodies, but after a few hard launches the car will twist itself in half without some serious strengthening..down each side there is a sort of ladder layout to the ribs, but it’s still really flexy. I’d suggest dropping it onto a 1/2 ton truck frame. I did some measurements once with a 77 Wagoneer frame and with some frame chopping, it’d work.